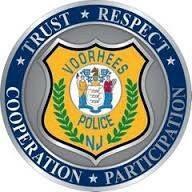 On Dec. 21 at approximately 6:38 a.m., Voorhees Police were dispatched to the 100 block of Kirkbride Road for a domestic disturbance involving a male armed with a gun and knife. Arriving Officers detained seven individuals inside the apartment, where the call originated. Subsequent Police investigation revealed that a male, 27, had multiple arrest warrants and was found to be illegally in possession of a loaded Glock 9 mm semi-automatic pistol as well as a bullet resistant vest. He was arrested and charged with terroristic threats, aggravated assault with a weapon, unlawful possession of a weapon, possession of a firearm for an unlawful purpose and possession of a weapon for unlawful purposes. He was remanded to the Camden County Correctional facility in lieu of $100,000 bail. In addition, Voorhees Police arrested a female (34) from the 1000 block of Sheridan Street, Camden, for being a fugitive from justice and remanded her to the Camden County Correctional facility. Voorhees Police also made a subsequent arrest of a male (19) from the 3900 block of Bennington Street, Philadelphia, PA for being in possession of narcotics paraphernalia, he was charged and released.